Menorca, or Minorca, is one of the Balearic Islands. It is less touristy compared to the big neighbours Mallorca and Ibiza and is great place to combine culture, nature and beaches. About 90,000 people live on the island, which in 1993 was declared a Biosphere Reserve by Unesco to preserve areas like the Parc Natural S’Albufera d’es Grau wetlands and the island’s unique archaeological sites. 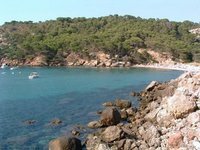 Even in summer it is relatively quiet on the island and finding some secluded beaches is possible. Menorca's surface cover approximately 700 square kilometres and the coastline is about 216 kilometres long. It has beaches but also rocky territories, coves and cliffs. The highest point is El Toro or Monte Toro, which is 358 metres above sea level. Mahon - capital and largest city. Monte Toro for a fantastic panoramic view of the island. Museu de Minorca, located in a monastery, contains the earliest history of the island, the Roman and Byzantine eras and Muslim Minorca and there are paintings from recent times. Parc Natural S’Albufera d’es Grau - wetlands. Menorca 2 A website collecting and frequently updating a list of upcoming events in Menorca. Menorca has a typical Mediterranean climate with warm and dry summers and mild but relatively wet winters. Summers last from June to September when temperatures during the day average between 24 °C and 28 °C with nights generally still above 20 °C. Occasionally, temperatures can hit almost 40 °C. Winters last from December to February with temperatures around 13 °C or 14 °C and nights around 10 °C. This is also the time when most rain falls, although autumn and spring have a good deal of showers as well and even summers can have some heavy showers now and then. Frost and snow are rare, but not unheard off during extreme times. Menorca Airport (MAH) offers a wide range of flights. Lowcost airline Easyjet provides flights to/from Bristol, Liverpool, London and Newcastle, though on a seasonal basis (usually April - October). This applies to most airlines mentioned here. TuiFly flies to Basel, Düsseldorf, Frankfurt, Hannover, Hamburg, Munich and Stuttgart. Monarch Airlines and Jet2.com serve some British cities as well, including Manchester and Belfast. Air Berlin serves Berlin, Cologne, Zürich and Palma de Mallorca, Iberia fliest to Madrid, as does Spanair (also to Barcelona) and Swiss flies to Zürich as well. Other airlines fly to/from Brussels, Amsterdam, Venice, Milan, Turin, Verona and a few other UK cities. Acciona Trasmediterránea, Balearia and Iscomar offers ferries connections between Menorca and both other Balearic Islands and onward connections to Spain as well. We have a comprehensive list of accommodation in Menorca searchable right here on Travellerspoint. You can use our map to quickly compare budget, mid-range or top of the range accommodation in Menorca and areas nearby. This is version 22. Last edited at 3:33 on Aug 2, 17 by sleepBot. 15 articles link to this page.